Adobo had truly evolved through the years from being the unofficial national food of the Philippines. With millions of Filipinos all over the world, it's now being prepared by hundred and one ways. This is a classic dish that has gone through being a quintessential or local to being glo-cal. Ask a typical filipino housewife who cooks this dish of a standard recipe and really there's none to share. Simply because every household had developed its own version to follow. For all Filipinos living in a foreign a land, I'm sure cooking this dish every once in a while will somehow connects us all back to our roots. In essence, it can be deemed any Filipino's comfort, nostalgic food. And since the ingredients of the dish are no difficult to procure it can be prepared anywhere else. How do you normally prepare your noodle dish? Do you opt for the use of the wet and fresh type or the fried, dried and pre-packed one? I recently found a good brand of the latter in the supermarket -Hong Kong Yee Foo Mee. This is the flat egg noodles that is the counterpart in Chinese of Linguine Pasta. Just like any other noodle, it can be prepared either in soup or dry. Recently, the dinner at home became another one of those days where I simply can't figure out what to stir in the kitchen. A close examine of the pantry lead me to this dish. Again, this is another quick fix meal. No sophistication in ingredients neither any complexity in the preparation. My kids enjoyed the smooth texture of the flat noodles. Likewise, it blended well with the taste of kangkong and dried shrimps. For more variety in taste, mushrooms can be added if you like. There's always something to look forward to when dining at Seafood Restaurants and indulging in a typical Chinese set meal. Be it the complete satisfaction from the whole repertoire or from the food itself, we are normally filled with a good munch of gastronomic proportions. Unlike other cuisines though, I'm still intrigued why dining in a Chinese Restaurant or in this case a Seafood Restaurant, equates to almost always having a whole set of meal. A la carte choice is hardly a second alternative. But come to think of it, that's maybe what a typical chinese dining experience is all about. Needless to say, just like any other set meals, the choice of food that will comprise of the set is key. One wrong choice might end up to satiation otherwise, ruin the entire dining experience. Fortunately, my first West Coast Seafood encounter proved to be a satisfying one. Just for the name alone - Coco Exotic, I'm already intrigued what this popular cake of a local bakeshop has to offer. It was recommended by a colleague many times over. Then, finally my palate found its way to sample a nibble. Rich yet far from overwhelming, chocolatey, medium sweet with a playful texture in mouthfeel, this is how I will describe the exotic element of this cake. This heavenly goodie is made up of layers of chocolate chiffon, mousse, cookies with a wafer like crunch and ganache. It's finished with a few chocolate carvings and red berry on top. It's not supremely to die for dessert or sweets but it's sure is one delectable, luscious treat in its own right. The interplay of the overall taste of the cake with an enjoyable texture or bite made it no less one hot item in the glass shelf. Since the launch of the GSS island wide, it's indeed supreme shopping madness that I've seen and experienced. Nearing the final stretch, and with few more days to go before the SALE tags are lifted, more cut prices and great finds are being uncovered. We checked out the 14th Craziest TOYS SALE happening at the basement level of Takashimaya Shopping Mall. The goods are absolute bargains! My children feasted on favorite items. There are deals of "3 toys for S$ 5", some are slashed from 30 - 80% off. You can take advantage of this to get your christmas gifts as early as now. Sale is on-going until August 10, 2010. "Comfort Food" has become the ideal descriptor used by many in association to food that gives lasting satisfaction. Individually, we have our own preferences on the food items that rightfully fit into this culinary genre. Be it a heart warming soup, a nostalgic home-cooked meal, or a familial & authentic feast, all is a delight to a craving palate. In Singapore, it's no difficult to find a favorite of this kind. Surprisingly, I found one from the initially hard to appreciate "packed lunch" at work, the Fish Head Bee Hoon. 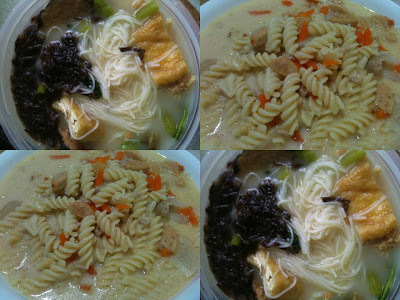 It's a rice vermicelli soup added with tofu, seaweed, vegetables and fried fish cake all soaked in creamy, milky, rich broth. Ironically, despite it's delectable creaminess it doesn't turn out to be satiating nor overwhelming. Maybe because the ingredients are in right balance taste wise. Undoubtedly, this is a food that is pleasingly hearty. The first half of year 2010 has been very good to me. I've been blessed with wonderful opportunities and new experiences. There were just too many to be thankful for. Among the significant ones was the wonderful recognition by the Singapore Blog Awards 2010. To be included in the list of the 10 finests in the Best Food Blog category is already a price to behold. I was elated, honored and humbled all at the same time. Tomorrow is the long awaited awards night. Whoever will grab the prices and the winning trophy, my heartfelt congratulations is sent in advance. Personally, winning is beyond my expectation now. No matter what, I think I've already walked away with a good many recollections. Now and again, I will take on my blogging journey the bits and pieces I've earned out of this acknowledgment. I am encouraged more than ever to do better if not best, to dream big and share more. Thank you to everyone who supported Our Taste of Life, from here and beyond. I've been invited to Media Conferences / Food Events / Product Launches a number of times. But for some reasons, I always decline. Until the invite to the Singapore Food Festival 2010 came, I finally yielded. For one, although I've been running a food blog for 3 years now, I still hardly consider myself part of the media. But this particular event caught my interest completely. I simply cannot resist. Singapore holds this annual food festival since 1994. By doing so, indeed, the country lives up to what it is known for, being a steaming pot of gastronomic experiences. And on July 16 to 25, we will all continue to explore, taste and celebrate. This year's theme focuses on "heritage, authenticity, time honored dishes and familial recipes". Rightfully so, the festival will parade the treasures of Singapore Chinese Dialect Foods namely Cantonese, Hakka, Hainanese, Hokkien and TeoChew.